Apple may have sold as many as 6 million Apple Watches during the December quarter, generating as much as $2.6 billion in revenue —and giving the company of almost 80 percent of smartwatch revenues during the period, new research suggests. The units estimate would represent 12 percent growth year-over-year versus calculations for the Dec. 2015 quarter, Canalys said. Apple doesn't release official Watch statistics, and in a results call on Jan. 31 said only that it hit "record" numbers in terms of "both units and revenue." Apple helped its share by offering a cheaper entry cost with the Series 1, and improved fitness features on the Series 2, Canalys suggested. 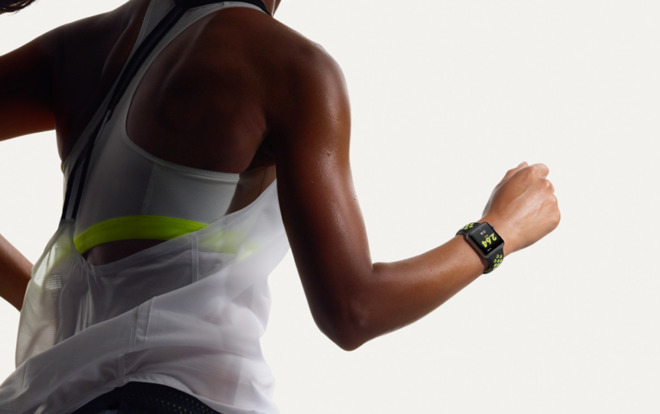 The Series 2 is fully waterproof with built-in GPS, while a special Nike+ edition comes with a lighter, more breathable band, plus special app integration. For 2016 overall, Apple is said to have taken 50 percent of the smartwatch market with 11.9 million units. Fitbit allegedly claimed 17 percent of the market —though it doesn't yet have a "true" watch —while Samsung hit 15 percent. All other vendors managed a collective 19 percent. Canalys' December-quarter estimates differ significantly from ones by Strategy Analytics, which put the Apple Watch at 5.2 million units out of 8.2 million smartwatches overall. Canalys numbers peg the industry at 9 million units. Little is known about Apple's plans for a third-generation Watch, but the company is thought to be working on cellular support, which could let people use the device independently of an iPhone.